Mr. Obama has promised to ... support so-called green technologies that will create jobs while benefiting the environment. ... sends chills down the spine. A government subsidy can be used to reduce the costs of production and increase supply. 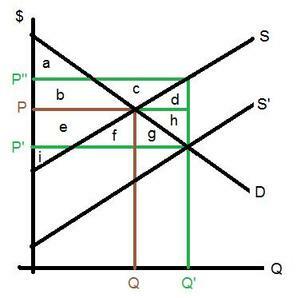 If the subsidy is equal to the difference between P" and P' then the supply curve will shift from S to S'. 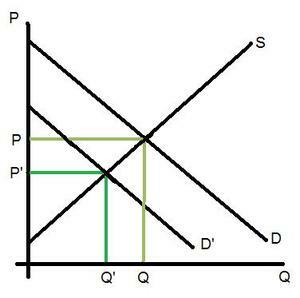 At the new supply curve the price will fall to P' and quantity produced and purchased will be Q'. In this way green energy production can be encouraged by government. The overall net benefits of a subsidy are negative. In other words, the gains to the market participants are worth less than the cost to taxpayers. Subsidies are inefficient. On the other hand, if green energy use helps avoid some environmental pollution, then the positive externalities associated with the supply shift (i.e., avoiding the negative externalities in the polluting market, see below) might make the subsidy payments worthwhile in terms of efficiency. This requires further analysis but the basic conclusion is that it is less expensive (i.e., more efficient) to tackle the negative externalities head on with a tax or cap-and-trade than to deal with them indirectly in the market for green substitutes. Suppose the increase in market quantity leads to an increase in the number of employed persons (e.g., "5 million green jobs"). This is a grand outcome, right? However, on second thought, the increase in consumption in the green energy market comes at the expense of energy consumption in substitute energy markets. 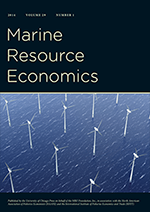 More can be learned about the overall impact of green subsidies on the economy with a "general equilibrium" analysis (i.e., considering the effects of a policy on more than one market at a time). The increased supply in the above diagram lowers the price of green energy and results in an increase in quantity demanded of green energy. Unless consumers decide to increase their overall use of energy products (and they might ...) then the demand for brown energy (i.e., coal and oil) will decrease resulting in a decrease in price and a decrease in quantity (see the second figure to the right). The number of brown jobs in the energy sector falls as a result of the reduction in quantity produced and consumed. Since both the prices of green and brown energy fall, the total amount of energy used may increase. If so, the total number of jobs in the energy sector may increase. But energy demand is inelastic (e.g., I'm not inclined to leave my lights on all day and night if electricity is cheap) so the total positive impact might be small. My guess is that the overall impact on the number of jobs is insignificant in the context of a 300 million person economy. But, is this what we are after? An increase in energy use? Not me. I'd prefer a decrease in the amount of energy use (conservation and all that). In order to achieve a decrease in energy use we should tackle the negative externalities of brown energy directly with pollution taxes and/or cap-and-trade. Luckily, these policies are cheaper overall than green subsidies and result in the same environmental outcome. In other words, the "green jobs" rationale for green subsidies is largely bogus. This MUST be the explanation for why one misunderstood economist at the environmental economics blog can't stand the green jobs argument but insists that green subsidies might be justified on the microeconomic, efficiency argument. However, he prefers avoiding the subsidies altogether with policies that penalize pollution. Consumer surplus is the difference between the height of the demand curve (i.e., willingness to pay and). Producer surplus is the difference between the price (i.e., per unit revenue) and the height of the supply curve (i.e., marginal cost). Producer surplus is equivalent to profit minus the fixed costs of production (i.e., rent, debt payments, etc).